Duratrack completed this custom metal forming project for a customer in the restaurant industry. 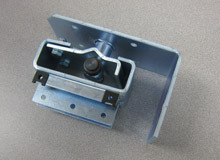 This steel door hinge is used on commercial doors in restaurants and designed to withstand heavy use. The hinge was fabricated by laser cutting and stamping the component blanks, forming the bends and tapping the threaded holes. Turning was completed on our CNC lathe, followed by deburring, spot welding, and assembly. CNC equipment and robotic welders were used to ensure that all hinges conformed to the customer supplied prints. The sleeve bearings were carburized to a depth of 0.015″-0.030″ and measured between 47 and 49 on the Rockwell C hardness scale. Hinges are zinc plated with a coating of clear chromate to customer specifications. Precision measuring instruments were used to perform dimensional inspection and verify that tolerances as tight as ±.003″ were met. 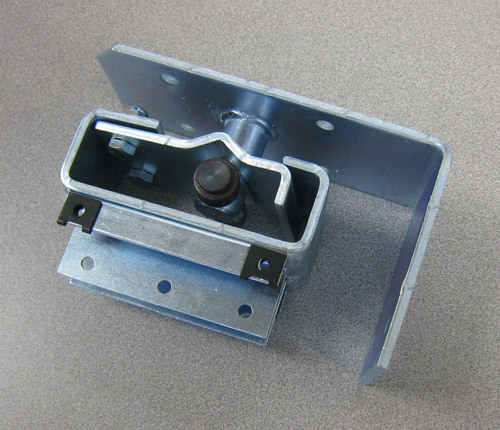 The heavy duty hinge is approximately 6.75″ x 3.00″ x 4.50″ and weighs 5.50 lbs. We produce approximately 1,000 of these hinges annually with a lead time of 2-4 weeks per order. For more information about this custom metal forming project, see the table below, or contact us directly. This door hinge is used on commercial doors in restaurants.